Happy Endings: Happy Groundhog Day! So, it was reported today from Punxsutawney, Philedelphia, that there will be 6 more weeks of winter. Is it bad to say that I’m kind of happy about that? Here in Phoenix, AZ, we don’t get long winters, at least not that I remember. Last year’s seemed pretty short to me. The year before, I think it snowed once…that was pretty exciting. And we recently have only begun to have steady rainfall…which makes my hair go crazy like Medusa, but whatever…which makes it so I don’t have to water the plants outside…which I am SO excited for, since I’ll be going up north to ski in early March. Bring on the snow! 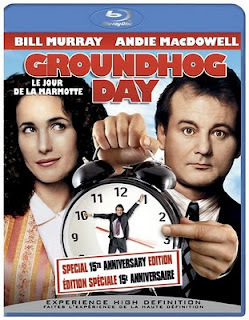 Have any of you seen the movie Groundhog Day? I think most of you have. So, my question to you: if you could repeat any day in your life, which would you choose? For me, it would be easy to say some momentous occasion like my wedding day or graduation or something. But I think I would pick a day that was more ordinary. I can’t think of one day specifically, but I love it when my husband and I spend some time out and about: in a bookstore reading side by side, conversing at Lollicup while drinking boba milk tea, taking a walk around the neighborhood holding hands, watching a movie at home eating popcorn, or even just spending time indoors on a rainy day.